Will Rajasthan help Congress reboot? Of the five poll-bound states going to elections in November and December this year, Rajasthan in western India seems to be most promising for the Congress, which has been decimated from power in most states. Opinion polls conducted in recent weeks have predicted the return of the Congress party in Rajasthan, which goes to polls on December 7 this year. It is not only the opinion polls which have predicted this. The ruling Bharatiya Janata Party (BJP), both in the states and at the Centre, is well aware of the predicaments. Several facts point this out. Why is winning Rajasthan so important for the BJP? If the Congress comes to power in Rajasthan, it could also signal that the Lok Sabha polls next year will not necessarily pave the way for BJP’s return to power. In the 2014 Lok Sabha election, the BJP won all the 25 Parliamentary seats from the state. However, it needs to be pointed out that since 1993 both the BJP and the Congress have taken turns to rule Rajasthan. 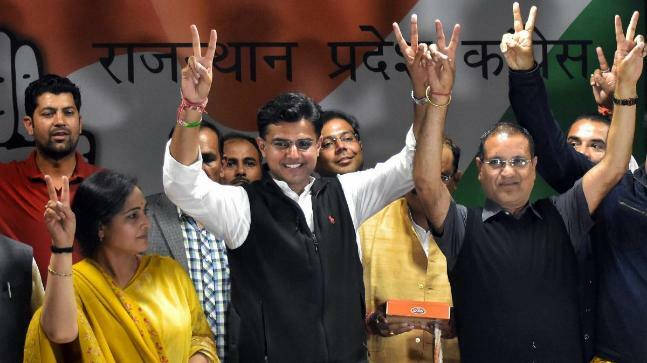 This time, the Vasundhara Raje Scindia government not only faces an anti-incumbency test but also faces challenges on several other counts. She faces detractors from her own party till the ground level. Interestingly, Raje has been at loggerheads with BJP national president Amit Shah as well as the Rashtriya Swayamsevak Sangh (RSS) over control of the state unit and her refusal to toe the Sangh line. Also, the RSS has been unhappy with her since she refused to pay heed to the protests of Hindu groups against her government’s drive to demolish temples in Jaipur for the metro rail project. Rebels from the ruling BJP are proving to be another headache for the party. Prominent among them is Manvendra Singh, the son of Jaswant Singh, former union minister in Atal Bihari Vajpayee’s cabinet. Singh who recently quit the BJP is expected to join the Congress anytime now. Hailing from the royal Jasol principality, Singh has a huge following among the Rajputs. His influence is spread over Jaisalmer and Barmer. Also, ill treatment of Jaswant Singh by the party high command has won Manvendra the sympathy of all communities especially the Brahmins, Muslims and Rajputs. In addition to these challenges Scindia has to face the Congress party, which is in a rejuvenating mode. Rattled over the predictions made by opinion polls during recent weeks, Shah has deputed several party leaders and union cabinet ministers to keep a watch on the poll situation. For this, he has two-pronged strategies. He plans to tackle it by caste calculation and through a tight grip on the three important regions of the state. For this, he has divided the state into three praants or regions – Jaipur, Jodhpur and Chittorgarh – and tasked six leaders with strong RSS connect. BJP national joint general secretary (organisation) V Satish and state BJP spokesman Satish Punia will cover Jodhpur while Rajasthan in-charge Avinash Rai Khanna and union minister of state Arjun Ram Meghwal will take care of Jaipur and Party general secretary (organisation) Chandrasekhar and union minister of state Gajendra Singh Shekhawat have been given charge of Chittorgarh. Satish Punia is responsible for Jodhpur praant as it has a sizeable Jat population. Meghwal will canvas among the scheduled castes and tribal population who are in majority in Jaipur praant and Shekhawat will work hard to bring back ‘unhappy’ Rajputs from the Chittorgarh division. Freebies have special place in the Indian elections. The ruling BJP has identified beneficiaries of various welfare schemes to seek votes in the upcoming assembly election. According to BJP state chief Madan Lal Saini the party has identified 5.1 million people across Rajasthan who have benefited from the schemes of the state government. Party workers will light up lotus lamps at their houses on October 21. When every vote counts, 5.1 million people means a lot, even as the Congress is engaged in a door-to-door campaign. As for now, everything seems to be going smooth for the Congress. Even the internal bickering within the party seems to be in a suppressed state. Even Congress president Rahul Gandhi has made several rounds to the state, addressing rallies and making pro-people remarks. Gandhi has also set up as many as nine committees to manage its campaign in the poll-bound state. Former chief minister Ashok Gehlot is heading the coordination panel and State party chief Sachin Pilot will chair the State Election Committee. This seems to be an effort to strike a balance between the two chief ministerial aspirants in the state. Taking a leaf out of Prime Minister Narendra Modi’s flagship scheme, Make in India, Gandhi during his campaigns in Rajasthan gave it a local twist. Campaigning in Dholpur, in eastern Rajasthan, Gandhi promised to put it on the Make in India map. The Congress chief, who has repeatedly accused the Narendra Modi government of failing to create jobs through his Make in India initiative said, “Your phones are all made in China. I want them to be made in Rajasthan, Dholpur… I want people to realise where Dholpur is”. Many more rounds of rallies, campaigns and counter-campaigns await Rajasthan till its people cast their vote on December 7.